Trump International Hotel and Tower in Chicago. Photo courtesy of Wikipedia. The website for President Trump's 52-story Manhattan luxury hotel boasts the best rooms money can buy. The five-star, five-diamond hotel, where room prices start at $400 a night, offers nanny services and provides each guest with a personal Trump attache. Guests can relax at the Trump spa or dine at Jean Georges, a Michelin 3-star "sophisticated New French eatery." But while Trump's showcase hotel checks every box in terms of luxury, it's a laggard in one area — how efficiently it uses energy. The 397,000-square-foot building on the southwestern corner of Central Park scored an 8 on a scale of 1 to 100, according to the city of New York's most recent energy benchmarking data. The hotel was among the worst performers for buildings its size in the president's hometown. But among properties owned or leased by the Trump Organization or that carry his brand, it's not alone. An analysis of New York City buildings for 2014 — the most recent data available — shows six of the nine Trump-branded properties that submitted energy use data under New York's benchmarking law had Energy Star scores that put them in the bottom 20 percent. The worst was the Trump SoHo hotel in Manhattan, which received a score of 1, placing it at the bottom 1 percent of properties of its type and size for energy intensity. On the flip side, one Trump property shined. The 71-story 40 Wall Street skyscraper in Lower Manhattan had an Energy Star score of 91. And it's not just New York. Trump's Chicago skyscraper received a rating of 9 in the city's most recent energy benchmarking data for 2015, tied for the least-efficient building of its size. The Trump Organization didn't respond to a request from E&E News to discuss the ratings. For Trump the real estate developer and reality television star, the benchmarking scores might go unnoticed. As a president who promised to leverage business savvy to "make America great again," the data seem to underscore to his critics an indifference to sustainability and the environment. From the campaign rhetoric to his first days in office, Trump has made clear that he thinks environmental regulations are a burden on U.S. competitiveness. He has pledged to roll back the "harmful and unnecessary" Clean Power Plan and withdraw the U.S. from the Paris Agreement on climate change. What does it all mean for the continuation of policies aimed at slashing energy use and advancing efficiency? "It's hard to say for sure," said Steven Nadel, executive director of the American Council for an Energy-Efficient Economy. "I'll be charitable and say it's not top of mind for him." Trump has railed against wind energy. He's vowed to help rebuild a diminished domestic coal industry. But he's spoken little about his view of efficiency. Most Trump-branded buildings in New York and Chicago bear weak Energy Star scores, according to the most recent public data available from the cities, where building owners must supply energy data under benchmarking ordinances. The rating system compares similar buildings for energy-use intensity to show how they stack up against peer facilities nationwide. A score of 50 means a building is more efficient than 50 percent of peer facilities. Sources: New York, Chicago. Just days after Trump's election, Nadel blogged about the outlook for efficiency under the incoming administration. The blog post references a comment from Trump about "green building" in his 2008 book, "Think Big: Make It Happen in Business and Life." "It's much more expensive," Trump wrote. "The science has not been perfected yet and in some cases the savings cannot justify the huge cost. You spend a tremendous amount of money now, and it takes 40 years to get your money back." Trump added, however, that he expected technology to make green buildings more cost-effective. In a February 2012 interview on CNBC's "Squawk Box," Trump was again critical, joking that a friend who leased office space in a green building regretted doing so. It's unknown what, if any, efficiency improvements have been made at the Trump properties in New York and Chicago over the past year. The complexity of lease agreements and ownership interests in the Trump portfolio also raises questions about whether the Trump Organization has responsibility or financial motivation for cut energy use at buildings that bear his name. If one thing is clear, however, being sustainable or "green" is not core to the Trump brand. While curbing carbon emissions might not appeal to a new administration that scrubbed references to climate change from the White House website shortly after being sworn in, advocates are hopeful Trump will see the economic potential of energy efficiency. "This is not some little niche thing," Nadel said. "This is a major employer and a major source of investment." Meanwhile, local initiatives, such as energy benchmarking and other state and city policies to cut energy use and emissions, take on even greater significance given uncertainty about federal policies. According to ACEEE, 26 states have energy efficiency resource standards that require reductions in electricity use through efficiency programs. More than half of those states are led by Republican governors. Energy benchmarking, too, is picking up momentum. Just last month, Los Angeles; Denver; and Orlando, Fla., passed ordinances within a matter of days that will require buildings of a certain size to report energy and water use. "It's an accelerating number of cities that are embracing this," said Cliff Majersik, executive director of the Institute for Market Transformation, a Washington-based nonprofit that works to promote building efficiency. In New York, for example, there was shown to be a correlation between neighborhood asthma rates and energy use intensity in multifamily buildings, according to benchmarking data collected under the city's benchmarking ordinance, Local Law 84. The law, one of the first in the nation, requires owners and managers of buildings at least 50,000 square feet to report the amount of energy and water use annually. A report by the city last year showed results: From 2010 to 2013, carbon emissions from 3,000 properties fell by 8 percent, while energy use dropped by 6 percent. The city of Chicago just released its annual benchmarking report last week. A total of 1,200 properties benchmarked for at least two years saved $17.8 million in energy costs. Buildings that had reported data for three consecutive years saw energy use fall 4 percent, while energy use in buildings that had reported data for two consecutive years was down 1.9 percent. At 2.2 million square feet, the gleaming Trump International Hotel and Tower along the Chicago River is one of the largest in the city. The 98-story mirrored skyscraper, completed in 2009, includes a mix of retail shops, a 339-room hotel and 486 luxury condominiums. The hotel boasts a "luxury wardrobe storage and management service" so frequent guests don't have to tote clothing and personal items in their luggage on each visit. They can use chauffeured Cadillac house cars or visit the 23,000-square-foot spa. But while the building isn't even a decade old, its Energy Star score of 9 is tied for worst among Chicago's 100 largest buildings. Chicago public television station WTTW was first to report the low rating. 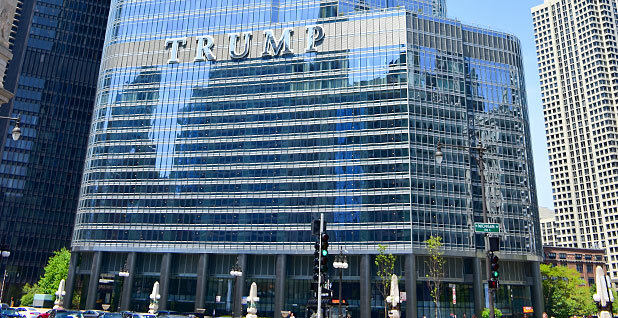 Katie Kaluzny, associate director of the Chicago chapter of the U.S. Green Building Council, met with the team managing the Trump building before it opened in 2009 to see what energy-saving features the group could highlight for its members. But there were none. Since the benchmarking story aired on Chicago TV, the building engineer at the Trump building called Kaluzny to tell her about various energy efficiency projects completed in the last year and offered her a tour. She has yet to do so, but said she looks forward to seeing how the building fares when the city releases the next round of benchmarking data. Brian Imus, executive director of the USGBC's Chicago chapter, said a key benefit of benchmarking ordinances making the data publicly available is helping owners better understand how their building uses energy and how they stack up against similar properties. "I don't know if it's a carrot or a stick, but it's bringing awareness to energy efficiency," he said.